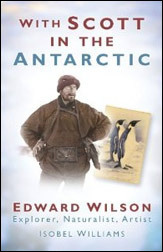 Edward Wilson (1872-1912) accompanied Robert Falcon Scott on both his celebrated Antarctic voyages: the Discovery Expedition of 1901-1904 and the Terra Nova Expedition of 1910-1913. Wilson served as Junior Surgeon and Zoologist on Discovery and, on this expedition, with Scott and Ernest Shackleton he set a new Furthest South on 30 December 1902. He was Chief of Scientific Staff on the Terra Nova Expedition and reached the South Pole with Scott, Lawrence Oates, Henry Robertson Bowers and Edgar Evans on 18 January 1912, arriving there four weeks after the Norwegian explorer Roald Amundsen. Wilson and his four companions died on the return journey. Trained as a physician, Wilson was also a skilled artist. His drawings and paintings lavishly illustrated both expeditions. He was the last major exploration artist; technological developments in the field of photography were soon to make cameras practical as a way of recording journeys into the unknown.